"Norman, got the Dancing Dragons pen today. It's beautiful! Thanks for the note also...Writes great! 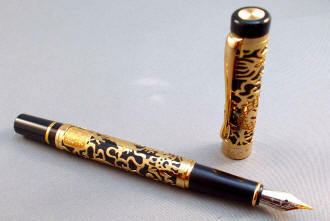 Using Ajisai Iroshizuku (blue) ink from Pilot that I got at the Philadelphia Pen Show. Love it!" 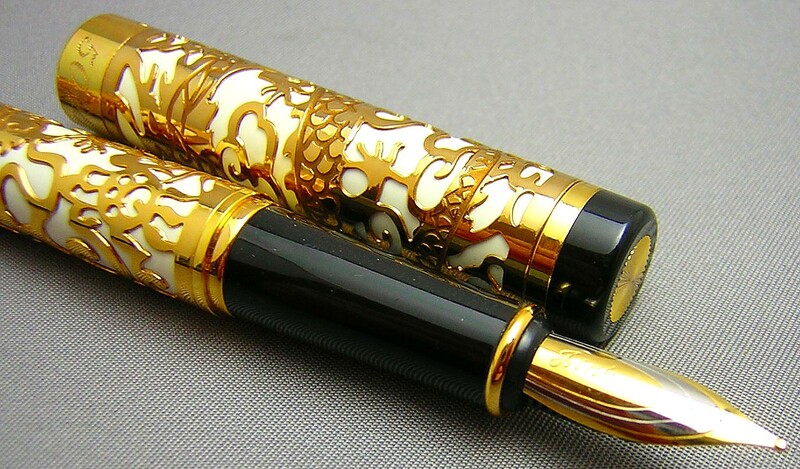 "Hey Norman, received my pens [also the Khaki Squares] on Tuesday, thanks for the quick shipping. 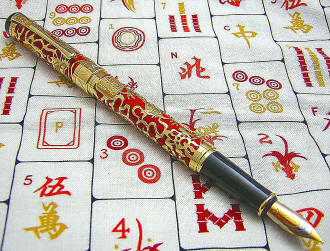 I absolutely love every one. 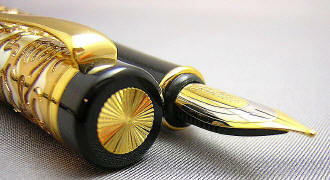 I already own a Cross and a Lamy and these put them to shame. 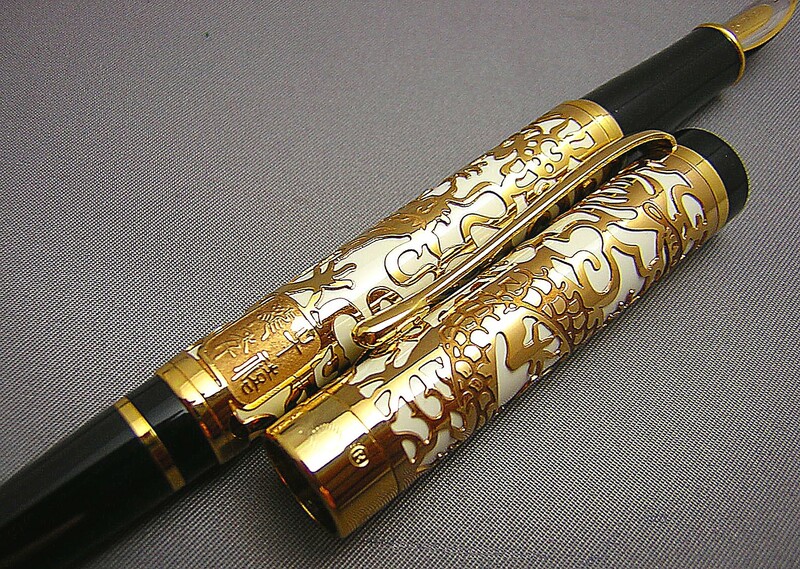 The weight and feel are excellent. The fact that they are metal and that they cap and post firmly was an awesome surprise. Thanks and we will talk again soon." "I received the Jin Hao Wooden Chariot, and Dancing Dragons today. They are truly works of art as well as reliable smooth-writing pens that actually write better than many of my expensive European models. 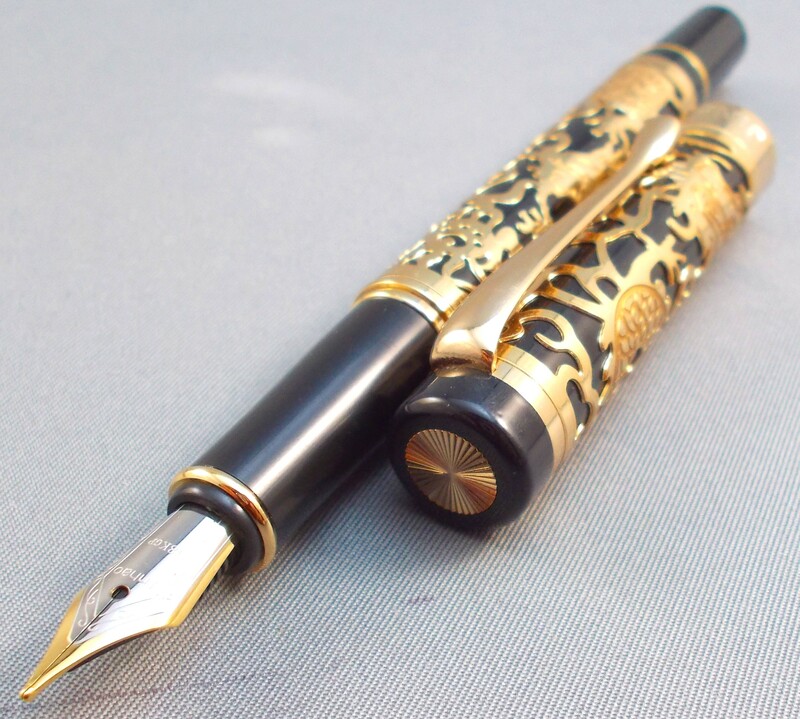 Thanks for your kind attention, first class service and the handwritten note. 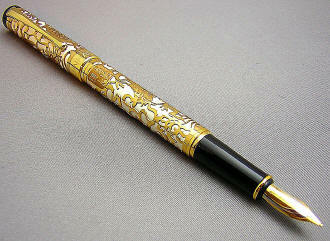 I look forward to purchasing more pens from you in the near future." 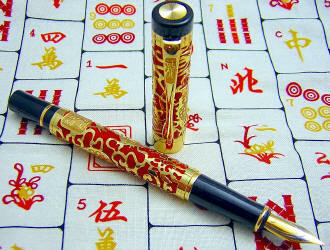 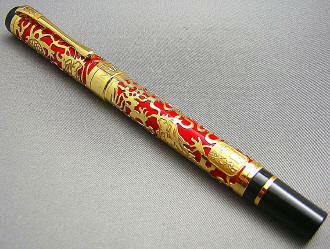 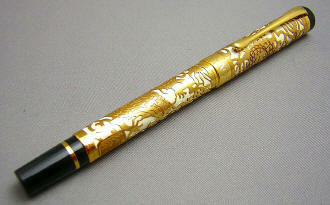 Here's another gorgeous pen from Jinhao...the Dragon Overlay. 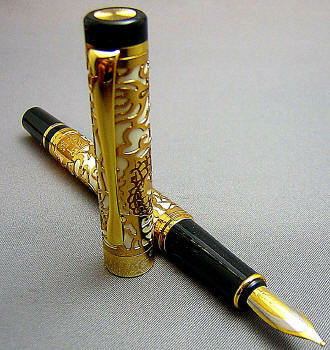 This slim pen measures 5-1/4" capped, 6-1/4" posted and 4-3/4" with cap held aside. The overlay is quite intricate, and features a dragon on both the cap and the barrel. 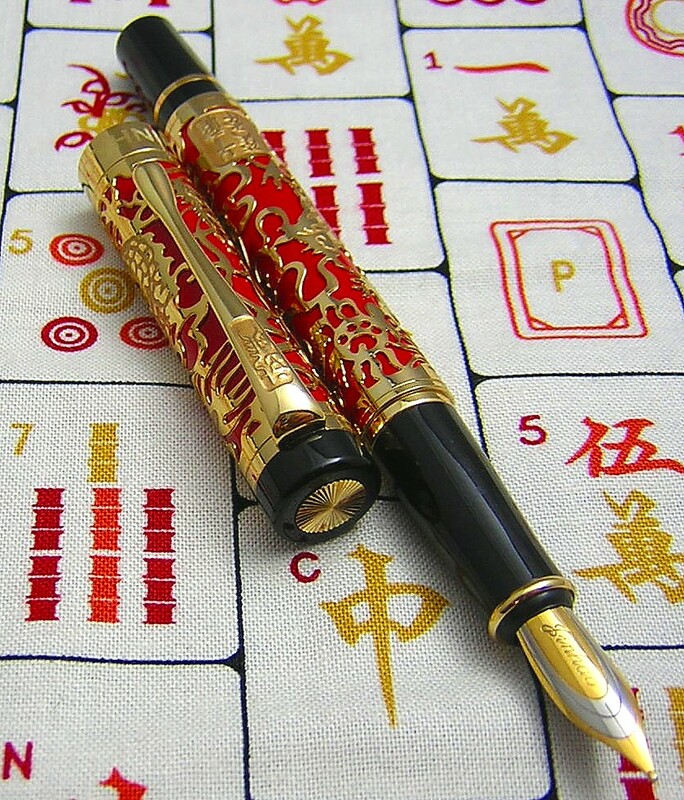 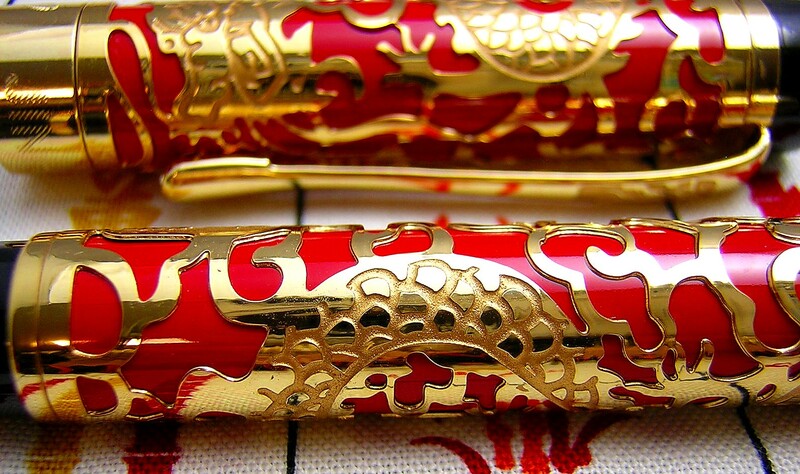 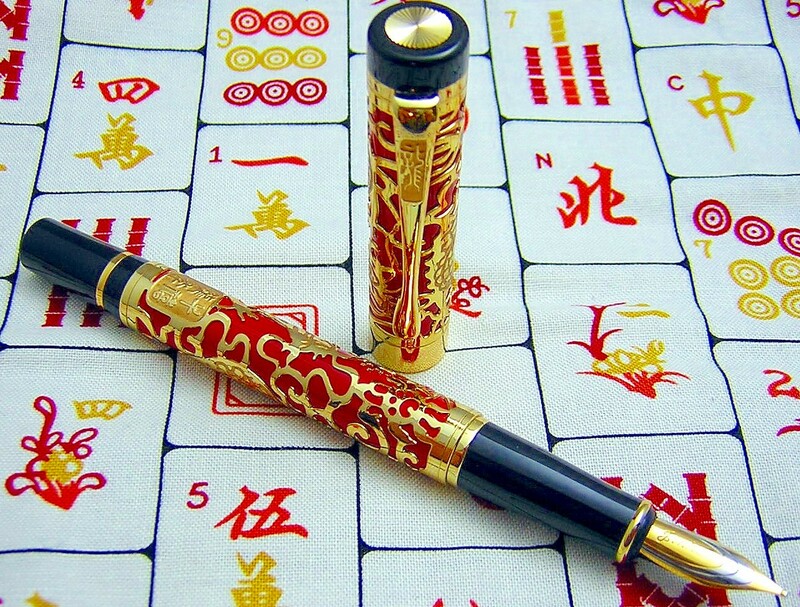 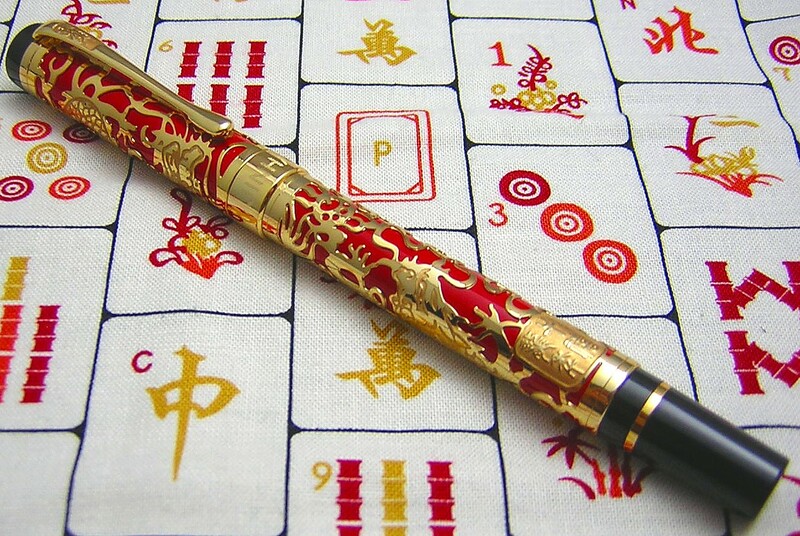 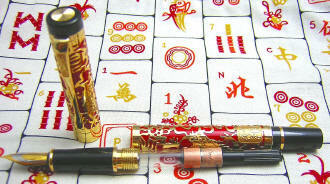 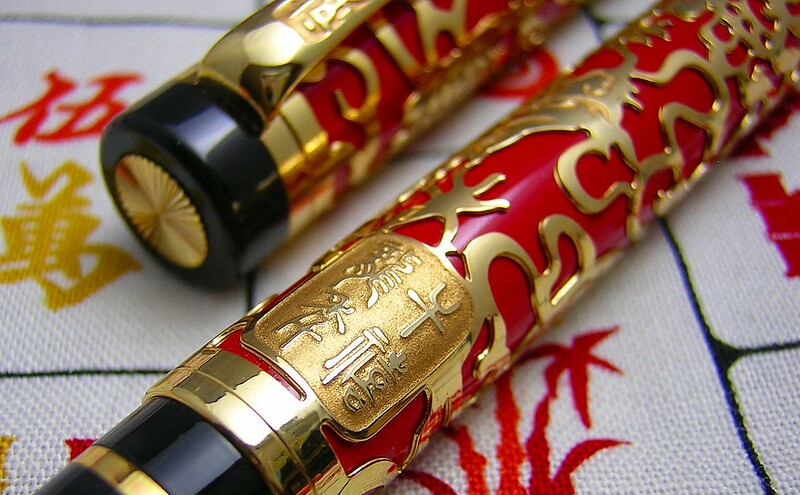 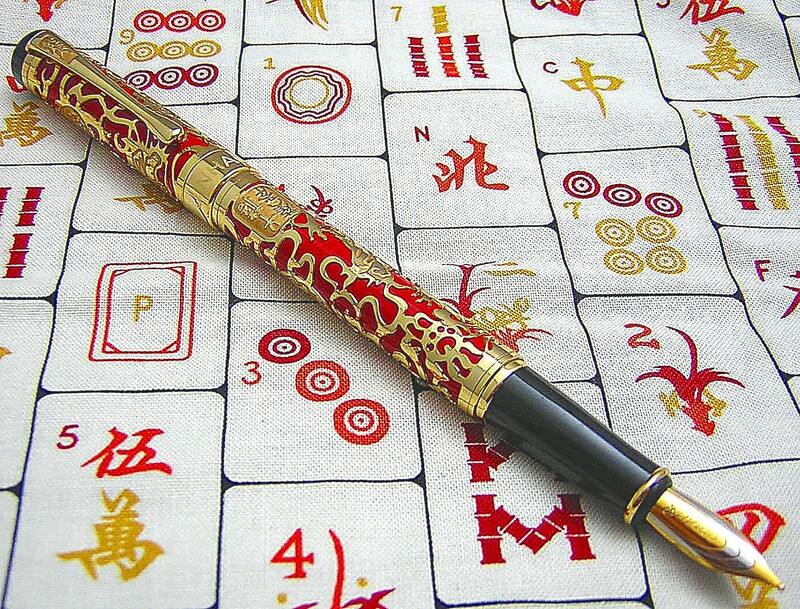 The underlying red lacquer on the brass pen really makes the gold-plated overlay 'pop'! 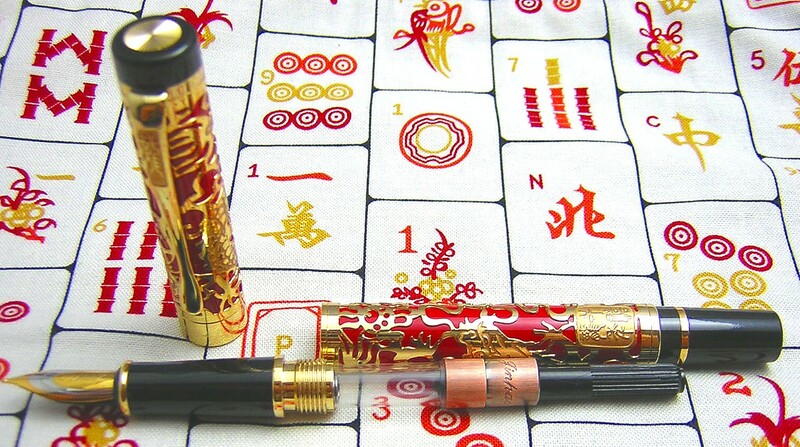 The barrel also displays a cartouche or seal which displays the Chinese characters for 'Dancing Dragon' or 'Dragon Dance'. 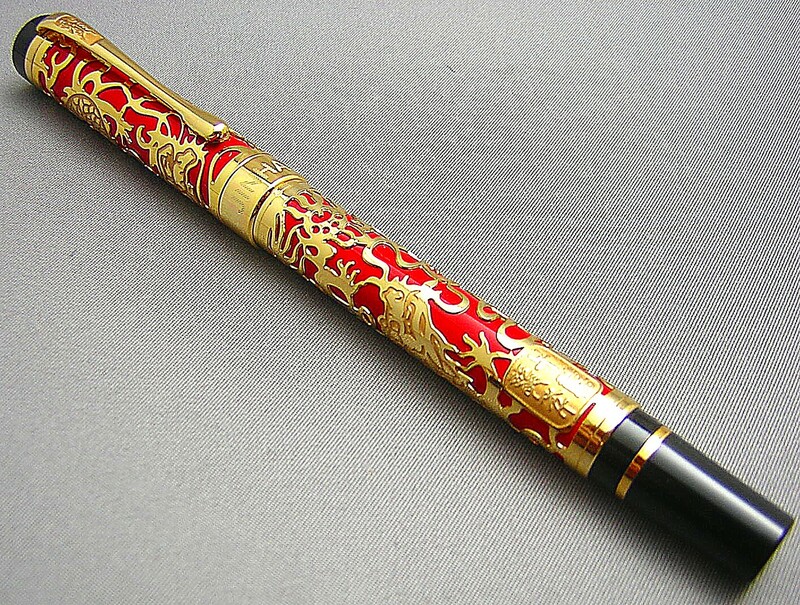 Although it's a metal pen, it's slimness prevents it from being too heavy, and isn't top heavy when written with the cap posted -- if that's your preference. 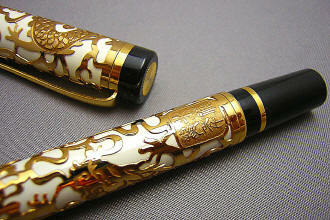 The cap ring has 'Jinhao' on one side, and the model number '5000' engraved on the reverse. 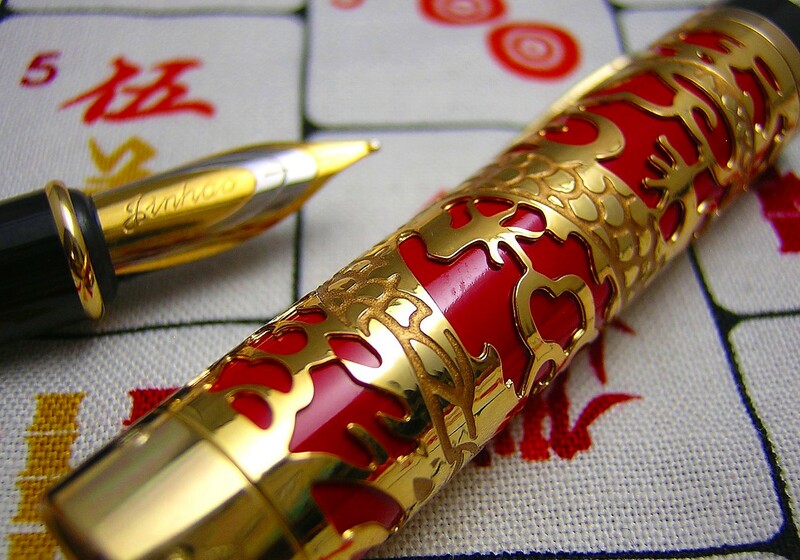 The cap is topped with a radial 'jewel' that's a nice visual touch, and the top of the clip displays the ancient Chinese characters for 'Dragon'. Removing the slip cap reveals the two-toned steel nib, which employs the attractive ovals pattern seen on many of Jinhao's nibs -- such as the Flames and I Ching pens -- and the company name is engraved upon it in script. 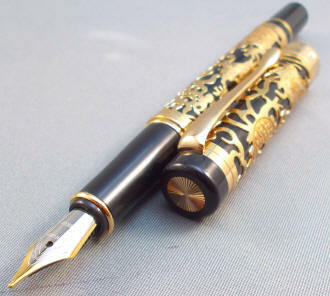 I would rate the nibs as a light-medium, meaning it lays down a line somewhere between a typical western fine and medium nib. Smooth, and not as stiff a nib as those found on many Chinese pens.